Our politics are being strangled by the power of money. Through the legalized corruption that is our current campaign finance system, corporations and the billionaire class are able to elect politicians they favor, and get the legislation they want. Workers pay the price, in lower wages, weakened unions, unaffordable housing, health problems, and more. New York has long had a “pay-to-play political culture…greased by a campaign finance system in which large donors set the legislative agenda,” as the Moreland Commission to Investigate Public Corruption said in 2013. In last year's New York elections, "the top 100 donors gave more to candidates than all of the estimated 137,000 small donors combined," according to the Brennan Center at NYU. If we want this to change, we need small-donor public financing of election campaigns – and New York has a chance to enact it now. There is growing support in Albany for reform that would provide a 6-to-1 match of small donations in statewide elections, helping candidates campaign without relying on the wealthiest New Yorkers. If we want working-class candidates to have a fair shot, we need this reform adopted now. 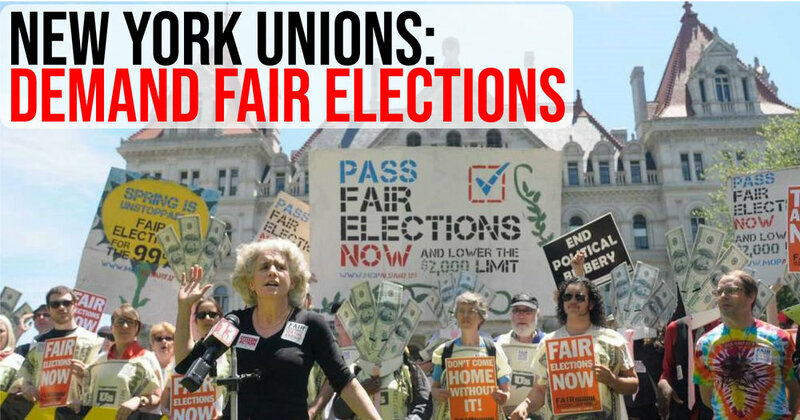 As members and retirees of New York unions, we believe most union members agree. A March 25 statement from the NYS AFL-CIO leadership takes a different view, arguing for inaction on small-donor public financing. Citing "the state’s fiscal condition" and " the cost of public financing," the statement said "now is not the time" to enact this reform. This makes little sense, since a generous estimate of the cost puts it at just 0.03% – three hundredths of one percent – of the $175 billion proposed in this year's Executive Budget.